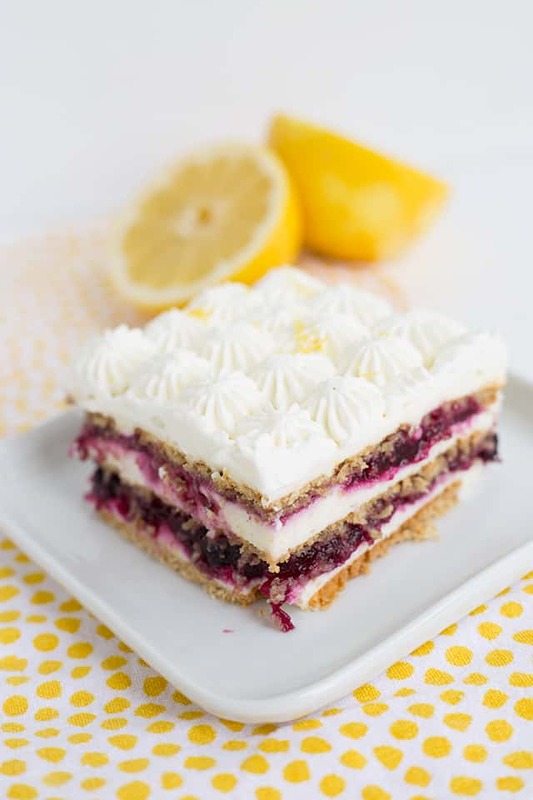 This blueberry lemon icebox cake just screams summer dessert! 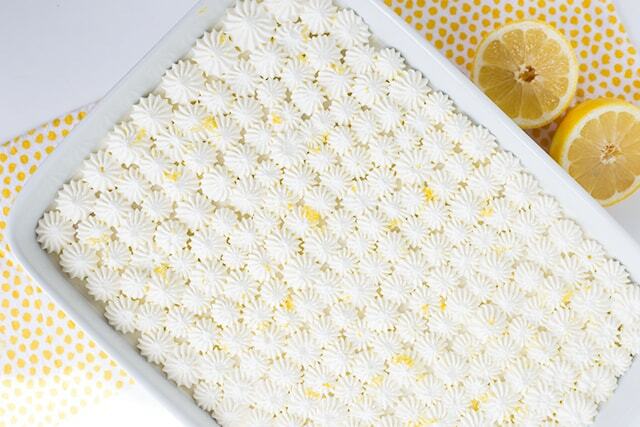 It’s no bake and the flavors really pop! 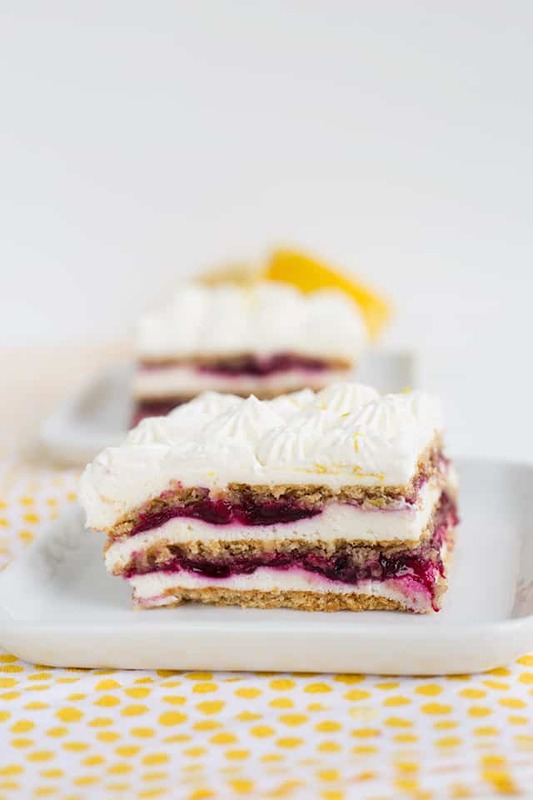 It’s even pretty to look at with the lemon cheesecake, homemade blueberry pie filling, graham crackers, and piped whipped cream all layered in it. I’m a berry fanatic. I love them in desserts, but I’m sure I’ve told you at least a dozen times now. I especially love being able to pick the berries myself. All the berry places near me seem to be closing up for good. I used to have a blackberry, blueberry, and strawberry u-pick close by and now I’m down to just a blueberry u-pick. In fact, I think the blueberry place will be opening either this week or next and I can’t wait! Somehow the lemon still manages to pop with all of that homemade blueberry pie filling that’s stuffed in this cake. I can definitely thank the lemon zest and the use of gelatin to keep the cheesecake firm with the extra amount of fresh lemon juice that I added for it. Otherwise, the blueberry pie filling would take over the place. For this blueberry pie filling recipe, fresh and frozen blueberries can be used. I love a fresh blueberry, but they’re not necessary this time. I like to grab the frozen bags of wild blueberries from the store. They’re smaller than regular farm-grown blueberries. I personally think that they pack a bigger punch of flavor too. This is a quick 4 ingredient recipe, probably like most pie filling recipes. You’ll need fresh or frozen blueberries, sugar, lemon juice, and cornstarch. I add the sugar and cornstarch together to make sure lumps don’t form when liquid is added. Cornstarch lumps are the worst. Slowly add in the lemon juice while whisking and you’ll be sure to have a smooth mixture. Add the blueberries and cook until thickened. That’s it. To make the icebox cake a little more appealing while in the pan, I piped my whipped cream with a Wilton 4B tip. I’m a huge fan of the 1M tip and that would do the trick as well. Lastly, I also used my zester and zested a little extra lemon zest on the top of the whipped cream. Use honey graham crackers instead of cinnamon graham crackers. The cinnamon kind of clashes with the bright, fruity flavor this time. The cheesecake mixture is runny, you didn’t do anything wrong. It’s easy to spread this way and will firm up in the fridge. Use FRESH lemon juice and not bottled lemon juice. If you don’t want to make the blueberry pie filling recipe, you may substitute with your favorite canned pie filling. 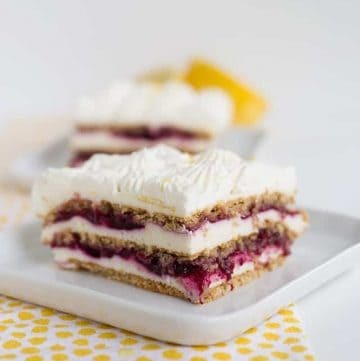 This no bake blueberry lemon icebox cake has layers of lemon cheesecake, homemade blueberry pie filling, graham crackers, and piped whipped cream in it. 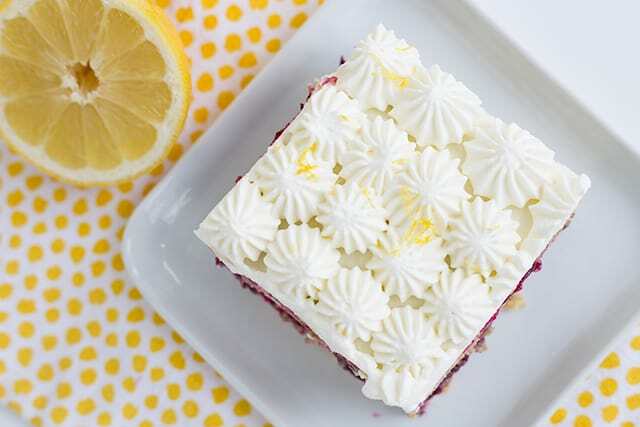 It's the perfect summer dessert! In a medium saucepan, add in the sugar and cornstarch. 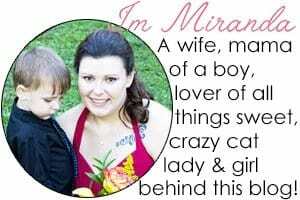 Whisk until incorporated. Whisk in the lemon juice until smooth. Add in blueberries and put on medium heat. Mash the blueberries in the saucepan once the heat softens them a bit. Bring to a boil and let bubble for 5 minutes until thick, stirring constantly. The filling will become clear rather than milky looking. In a small microwave-safe bowl, add in the gelatin. Stir in the fresh lemon juice and water. Let sit for 10 minutes until the gelatin is firm to the touch. Work on the rest of the cheesecake while waiting. In a large bowl, add in the cream cheese and sugar. Beat on medium with a hand mixer until smooth and creamy. Add in the lemon zest and butter and mix until combined. In a separate bowl, add in heavy cream and powdered sugar. Using a hand mixer, beat until stiff peaks form. Microwave the gelatin for 30 seconds until it's completely liquid. Stir and let cool slightly. Beat the slightly cooled gelatin into the cream cheese mixture. Lay 5 graham crackers in the bottom of a 9x13 pan. I had to break up the 5th graham cracker to fit along the sides of the pan. Evenly spread one-third of the cheesecake batter on top of the graham crackers. Add half of the blueberry pie filling on top of the cheesecake mixture. I added it in dollops all over the cheesecake and spread it out carefully so you don't disturb the cheesecake underneath. Add another layer of graham crackers. Break up the 5th graham cracker to fill in the holes along the side of the pan. 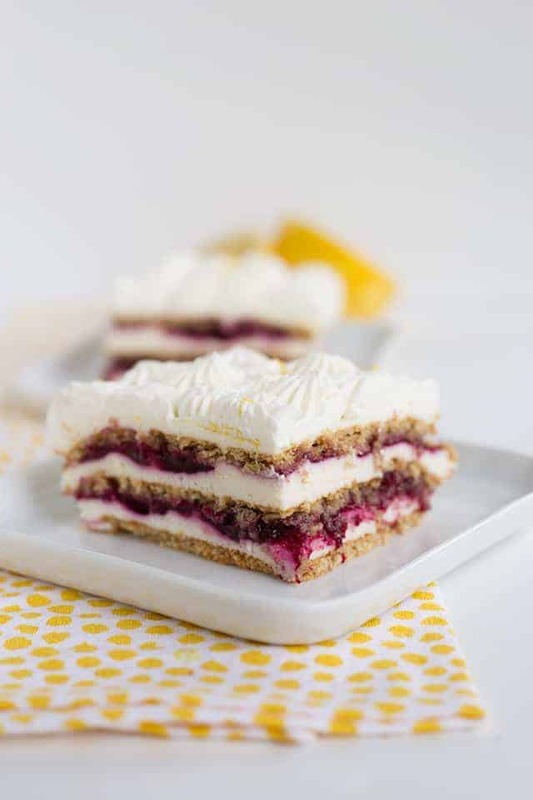 Repeat the cheesecake, blueberry, graham cracker and cheesecake layers. Cover with plastic wrap and let chill until the cheesecake layer on top has firmed up. This may take 1 - 2 hours. In a mixing bowl, add in heavy cream and powdered sugar. Using a hand mixer, beat until stiff peaks form. Add the whipped cream into a piping bag fitted with the wilton 4B tip. Pipe whipped cream stars on top of the cake. Sprinkle the lemon zest on top of the whipped cream. Cover and refrigerate for at least 4 hours for the cake to completely set up. I prefer overnight.